Say it isn’t so Batman. Sometimes a headline can be misleading but this one is accurate. This Spring I will be retiring my Humphrey’s Battle Box from competition. After 19 months of hard use the big red rib machine will be put out to pasture on my back patio. While she will no longer follow me to comps she will still be my go to practice smoker. No more calling friends on Thursday night to help me wrestle her into the back of my truck. What gives? Retirement? She is still in her prime. Did you get drum fever and you’re jumping on the Hunsaker bandwagon with Scott? Is there a Yoder pellet smoker lurking around the corner? A stick burner? Please stop the madness. Nope. None of that. Yesterday Chad from Humphrey’s called and we agreed that RFB needed a shiny new cooker to use at comps this season. 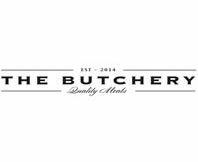 We are stepping up to the Qube’d Battle Box so we have the additional space needed so that we aren’t moving racks around and juggling meat. 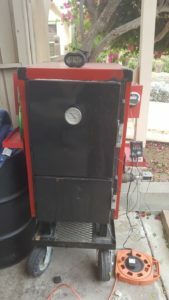 We cook pork, ribs and chicken on the Battle Box so a little more room will be a plus. RFB has officially joined the Humphrey’s Pro Team. So if the old Battle Box worked so well why would you even think about making a change? Good question. We are a very process driven team and we do not make any changes unless we can prove there is a benefit. The Battle Box is a tank and is super durable so it’s really comp friendly as it gets treated roughly and puts up with the abuse. It’s also well insulated and has a large firebox so long cooks are no issue and the weather has very little effect on it. My only complaint is that I can only fit 2 racks of ribs on a cooking grate (laying flat). Which means at a comp I have to move racks around so that the ribs cook evenly. Reverse flow smokers typically run hotter at the top and cooler at the bottom. I have a rib sweet spot and to keep my ribs even I have to juggle them around. 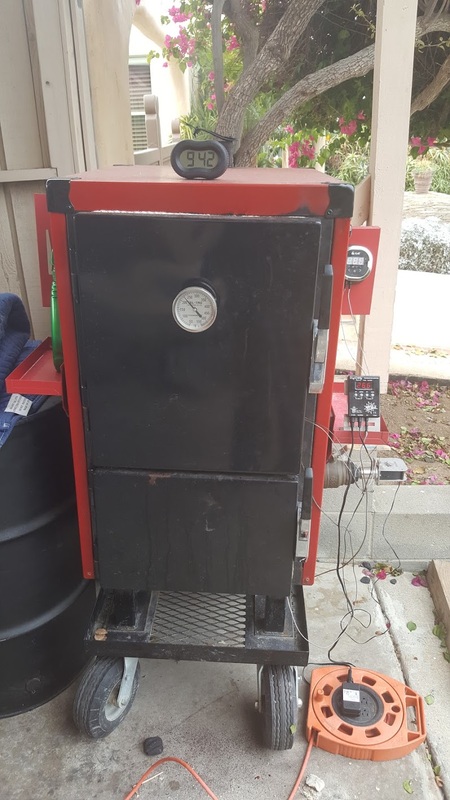 By switching to the 6” wider Qube’d model I can have 3 racks of ribs in the sweet spot and no more rotating ribs and worrying about dripping spots. Pork and chicken live at the bottom and top respectively so no change there. Other than that the only other reason to change is that Humphrey’s wants us out there rocking a gorgeous new smoker. With the addition of the trailer. Wait what? You bought a trailer too? Well yes we now have a trailer. It’s not a huge porch type with tons of chrome but it will make life much easier when it comes to getting ready for comps. Don’t get me wrong, I am fine with the minimalist set up but it will be so much easier with a nice well organized trailer. The buildout of the trailer begins in January and we will have a blog detailing the progress on it. It should be wrapped and ready about the same time the new cooker arrives. Man, that’s a lot of stuff happening in such a short time. Yes. You are correct. Not much of an off season for us. In addition Chad will be sending pictures of the new cooker build and so stay tuned as we chronicle the Qube’d Battle Box build on the site. It’s going to be a busy year for RFB in 2017. Subscribe to our feed and join us on the ride.